As Blog Every Day in April comes to an end – I can’t believe I actually did it – I wanted to wrap things up with a post about the things I’ve found myself liking during the month of April. Steampunk Jewelry. In particular, my new Golden Snitch with working clock necklace. I don’t know what it is about this sort of jewelry that appeals to me. Perhaps it’s because it looks delicate, while still being tough. Perhaps it’s that antique vibe that it gives off. I don’t know, I just like them. I’ve also found out that one of my favourite jewelry makers has opened a new website with jewelry based on Holly Black’s Curse Breakers trilogy! I loved Vivian Hebel‘s Mortal Instruments shop, now I’m loving her Curse Breakers shop. I’m especially liking her White Cat pendant, I might be getting it in the near future. Though the Curse Breakers shop isn’t steampunk, I’m still loving her designs. Unless you’ve been living under a rock, you might not know that I have a new phone and that I LOVE IT! 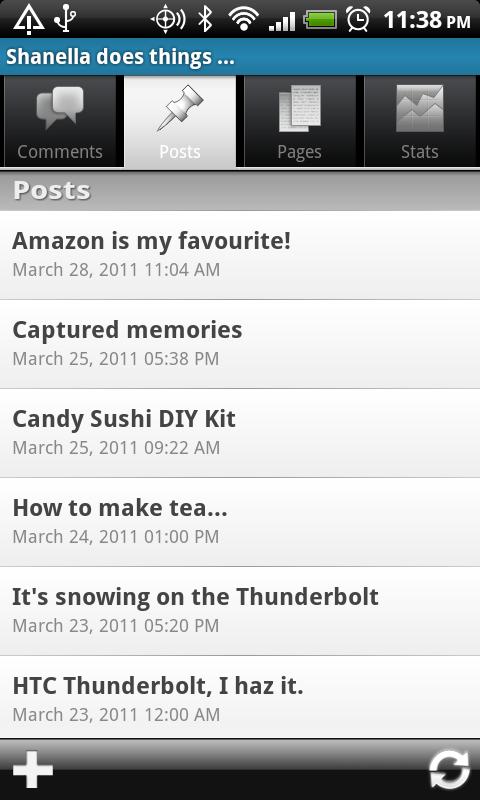 My HTC Thunderbolt is by far my favourite gadget this month! I have been finding new ways to make it work for me, from reading books to counting calories, this phone almost does it all. I love the camera, it takes some really great shots! 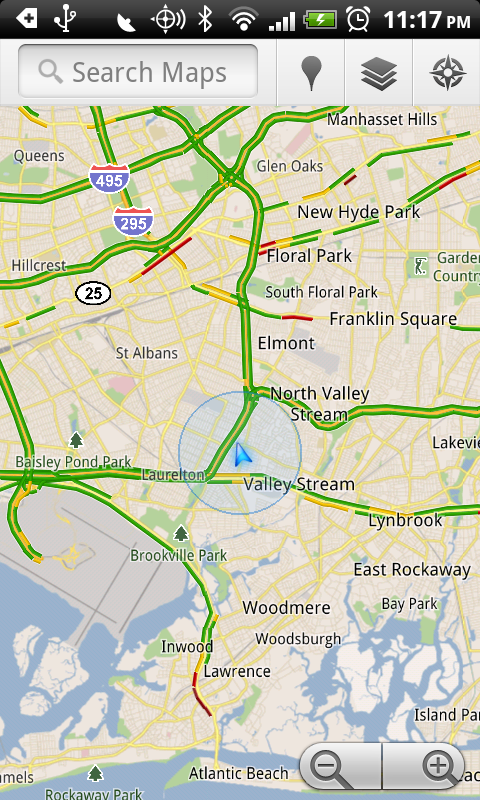 I also love the different Google apps that integrate seamlessly with the phone. If you’ve been living at the top of a mountain all alone, you might not know that I do almost everything with Google, so having a phone like this is a major advantage for me. My new favourite Google app? Why, that would have to be the Google Goggles. It’s a lot of fun to play with, I can’t wait to use it some more! Some great things happened at my book review blog this month. First I decided to do a Maureen Johnson themed week, since I follow her obsessively on twitter, and I was looking forward to the release of her Last Little Blue Envelope book. Also, she’s the creator of BEDA, so, I suppose that pretty much means that I think she’s cool. Themed week was a great success! First, I was able to see Maureen’s craziness in person when I attended the Zombies vs. Unicorns debate and so I posted that video to the blog and Maureen retweeted it! Also, I created a map showing all the places Ginny went during 13 Little Blue Envelopes which she loved and retweeted as well. So with the help of Maureen, my little book blog had 1,035 unique visitors during that week! That might not seem like a lot to all the popular bloggers out there, but to an obscure blog that’s just a pet project for a year, it’s golden. As a person not quite into fashion, I still found this site to be so much fun that once I stumbled on to it I signed up! Polyvore allows you to create layouts with different fashion styles as though you were doing a magazine spreads. It’s really fun just to play around in and think of different outfits and pieces that go together. You can even try to search for things you’ve recently purchased and find accessories for them. Definitely a time waster for me, but a fun one nonetheless. Did you watch the Royal Wedding? Were you up at 4a.m. to do so? Well, hats off to you, I preferred to sleep in a bit and look at pictures/video clips later. It was a cute wedding, but for some reason, even though it was a public affair, I didn’t feel fascinated by it. They don’t care about me, just the revenue I give to them by supporting the wedding. It wasn’t amazing in any way, just a normal ceremony and service steeped in tradition. I suppose my mind wasn’t blown by anything that went on there, and I think the biggest reason for that was that it wasn’t a wedding for someone I know and love. People get married every day, so what’s the big deal here? There is one aspect of the Royal Wedding that I did find interesting and that was the parade of hats! I’ve always loved hats. I wish they were back in style, I’d wear them everyday! But in lieu of hats, I love the fascinator! The one pictured there is from Dillards.com. I hope this is one style that begins to trend again. So it’s been a long month, I’ve posted a total of 38 posts, at least one post every day so I deem this a success. I have successfully completed BEDA. 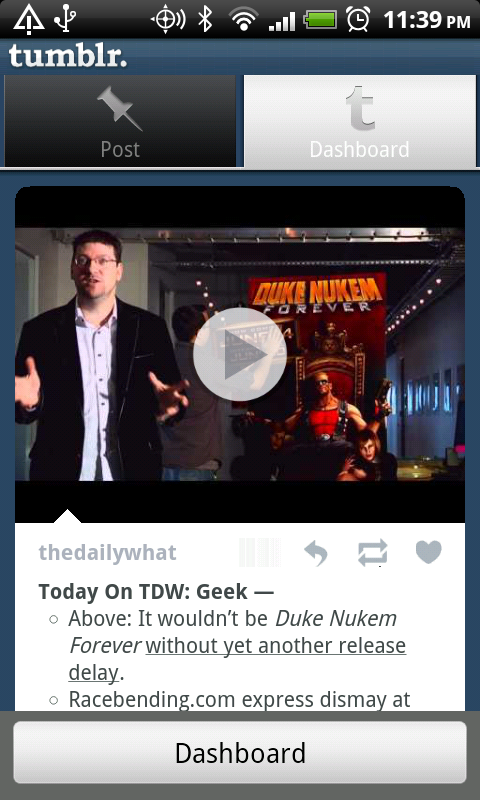 There were days where I struggled to figure out what write about and would browse my RSS feed for some inspiration. There were days where I had so much that I wanted to write but not enough time to do so. I doubt I’ll be able to keep this every day momentum up. However, it’s been fun. April has been better for it. So much so that I finally got the domain shanella.com! Woot! 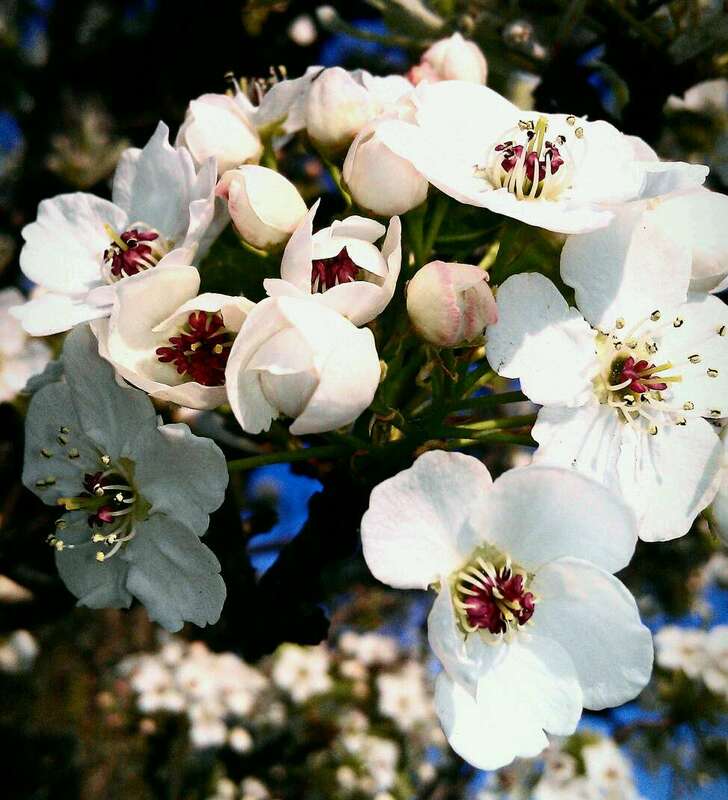 Fare thee well and have a lovely May. Well, it’s not so much a hobby as an appreciation of my new mobile phone camera. 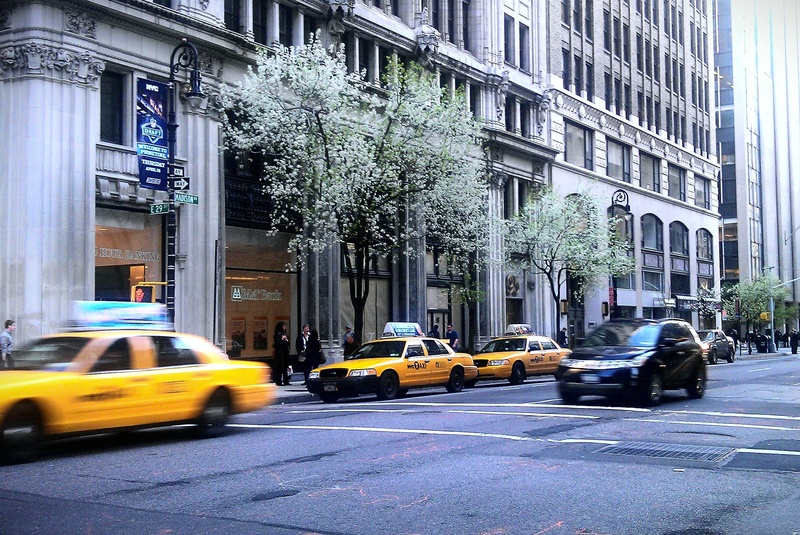 Along with that came the want – and sometimes urgent need – to use that camera. 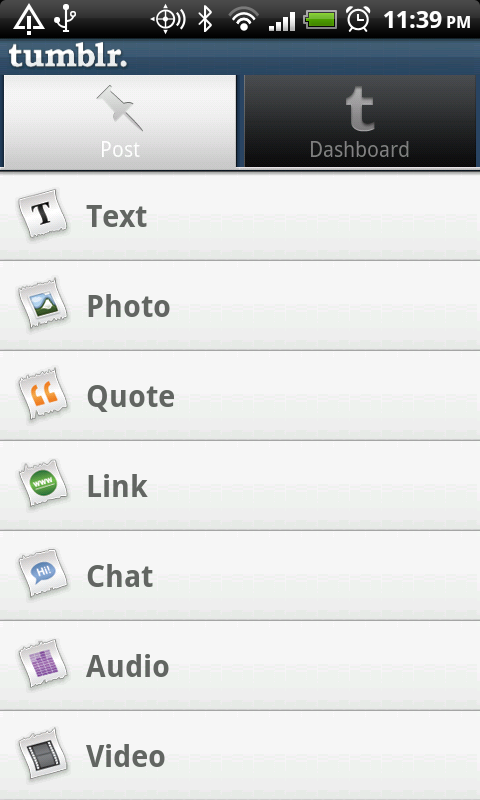 Then, I downloaded FXCamera and with THAT came an even greater want to capture images. Lately, I’ve been noticing trees. 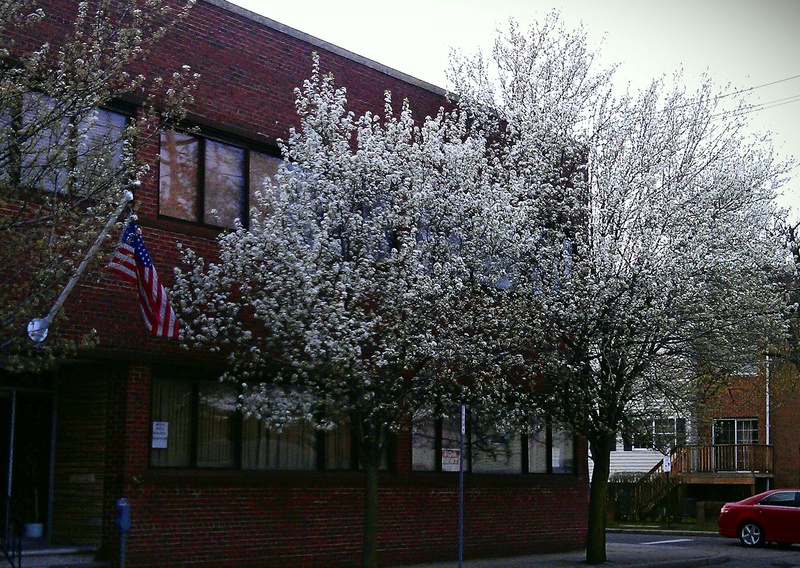 Trees are interesting, especially in a place with four seasons. In the summer they are green and alive, waving their branches in the wind. Some of them look a little overweight, their branches practically choking with leaves. In the autumn their leaves begin to change colour and fall. The odd thing is, the process of the leaves dying actually looks beautiful. Yes, there is cleaning up after them, but there’s something about driving down a highway lined with changing leaves that makes me want to pull over, sit on the hood and stare. There’s also something to be said about stomping through a pile of fallen dry leaves. In the winter they are bare, yet, majestic. There’s just something regal about them as their branches stand, stark naked in the air. There’s also something beautiful about a tree after a snowfall. The way the snow clings to the branches, softening the barrenness if only for a moment. The days are a little longer and little buds begin to form on bare branches. 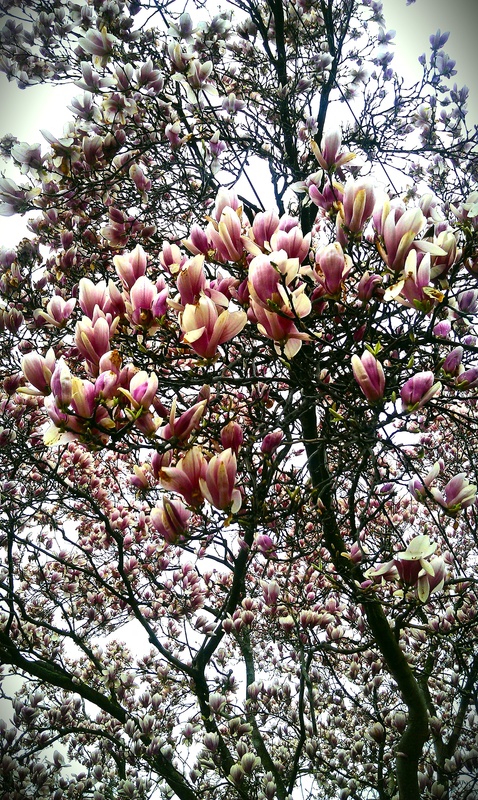 Then, almost suddenly, the tree blossoms and there’s an excitement about them, like a girl putting on a new party dress. Like they are preparing for a dance. And then comes the spring. 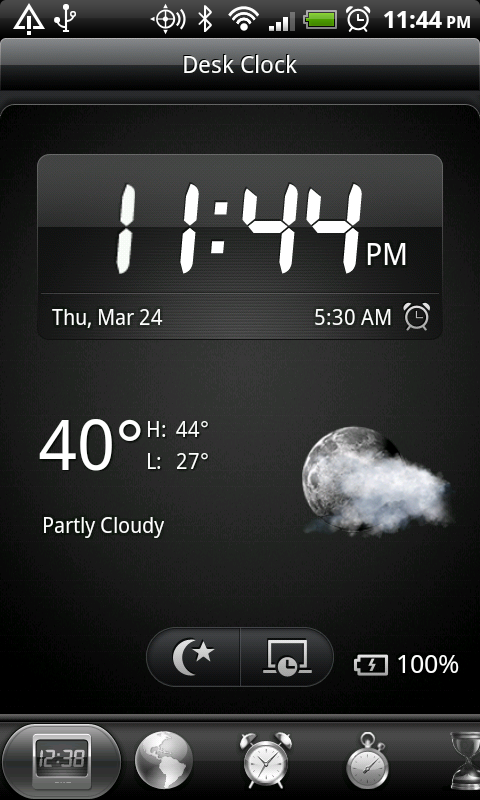 In the clock view, in charge mode, you can see the charge of the battery. Quite a few folks have been asking what I think of the battery life. Will I get a larger battery? How often do I have to charge it. Before I answer those questions there is one thing I want to explain. Before my love story with the HTC Thunderbolt, I had a Blackberry Tour. I chose Blackberry over any other smartphone because it was something I was accustom to, it was efficient and it did what I wanted it to do at the time — check email, browse the internet and some SoMe here and there. However, the more I used it the more I realised that it really was just an email machine. The browser – though better than before – was still lacking and the social applications were subpar. Yet, I kept it because it was a good phone. The trackball got stuck – a known issue – and they replaced it, but for some reason the ball behaved strangely when it got cold and it sometimes decided to be sensitive and other times not. I had an unlimited data plan and I barely used it because the phone itself turned out to be a bad investment. The battery was losing charge within 5 minutes of talk and 15 minutes of data usage. The phone would restart on its own and even though it had a full battery it would be completely drained. If it wasn’t plugged into a power supply it was just a paper weight. Or a weapon. Whatever way you want to look at it. I waited this out for six months, just waiting for the 4G phone to come to Verizon. There were rumors of a new HTC Incredible, then the Thunderbolt, then the 4G and I just kept waiting. That was 6 months of a useless phone. So the battery life of the Thunderbolt? INCREDIBLE. I charge it before I go to sleep. Unplug it (so it doesn’t overcharge like the Blackberry did) while I’m asleep. Let it charge to 100% while I get ready to go out. I use it nonstop on the train. Sometimes I use it for watching YouTube videos in HQ, or checking out blogs/tweets/facebook and other times I use the Kindle or Evernote apps. By the time I get to work — depending on what I use — it’s either 90 – 60% charged. I usually plug it into the wall or the USB port around 2 or 3pm and let it charge until 100% or until I leave. If I’m going out after work this is sufficient for me until I get home. I think this is normal behaviour, especially since I’ve used 2Gigs of data in 21 days of having the phone. I don’t think I’ll get a larger battery. I think that when you have a smart phone you need to be practical and understand that the more data you use, the more apps you use, the more battery you use. It’s like a mini laptop without the mega battery. So yes, I’m satisfied with the battery life. I’m satisfied with the phone (thus far) and I’m SUPER glad that I’m not throwing away money each month because my phone is inefficient. I don’t like cooking (my mom says, amen!). In order for me to cook, it’s almost as though the idea has to be planted in my head, either through a friend or some random advert, that makes me wonder how something is made. Then I’ll go about looking it up and trying it out. 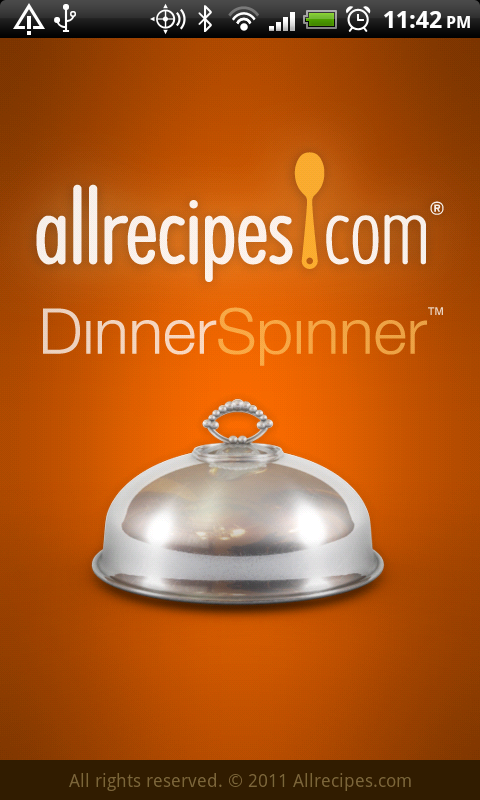 However, when I do cook, one of my favourite sites to use is allrecipes.com and one of my favourite apps is the Dinner Spinner. 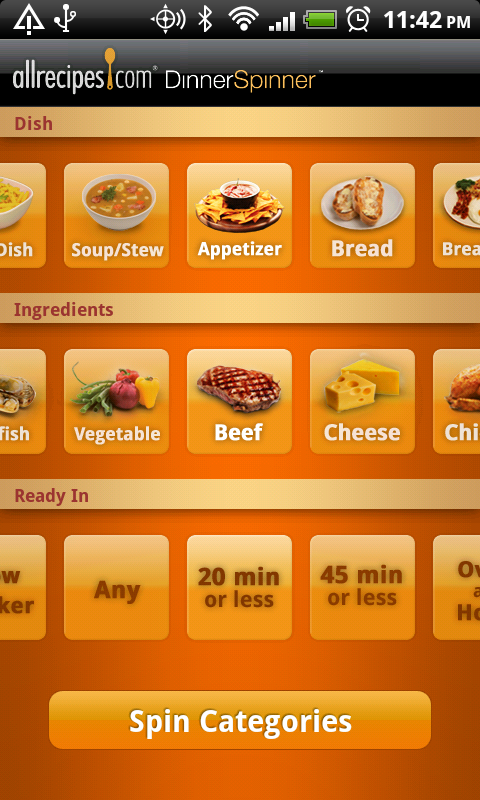 You select your options (and there is even a slow cooker option) and then you can view the matches. 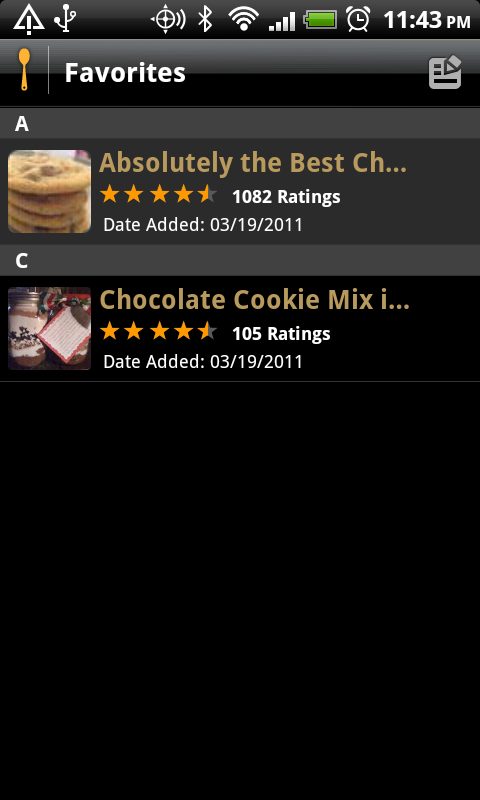 If you like a recipe you can add it to your favourites to go back to form time to time. Absolutely fun! I’ve had an Evernote account for a while now, however, I didn’t use it often. I didn’t see the need for it when all I use it on is my computer. 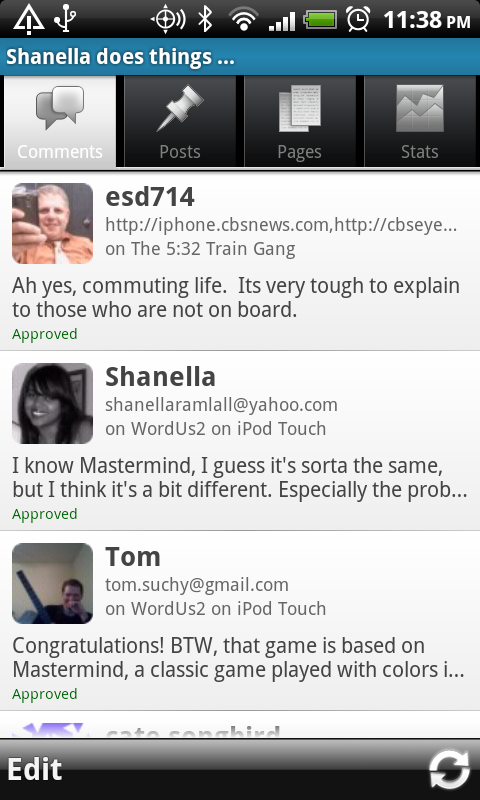 However, the Evernote app for the HTC Thunderbolt is absolutely amazing and awesome and I use it almost every day! The options are pretty much what you’d see on the website. 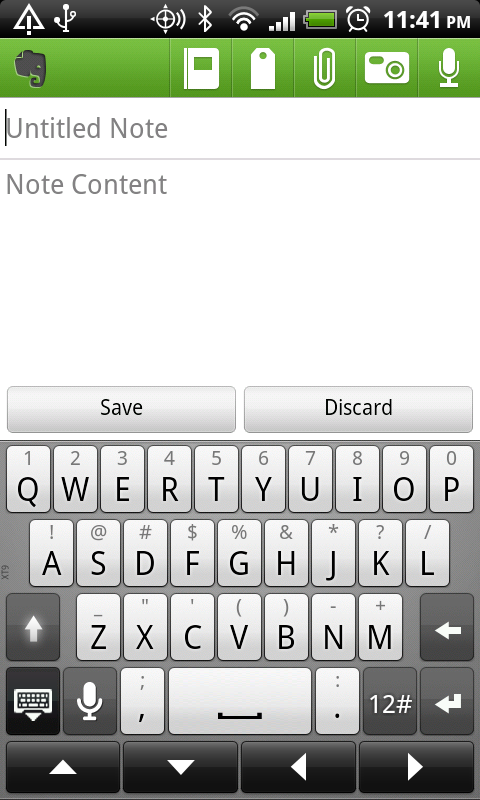 You can start a note in any of your notebooks. 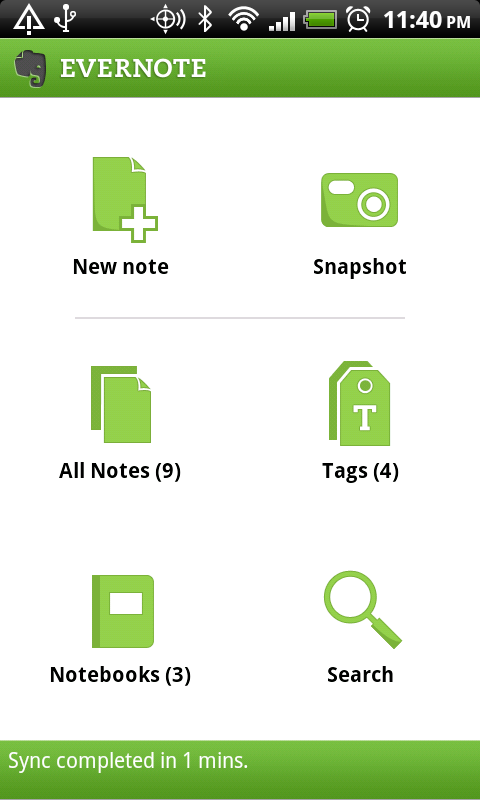 Search of a specific note; I don’t have a lot of notes as I’ve recently started using it on a frequent basis, but it’s helpful to know that I can search if needed. 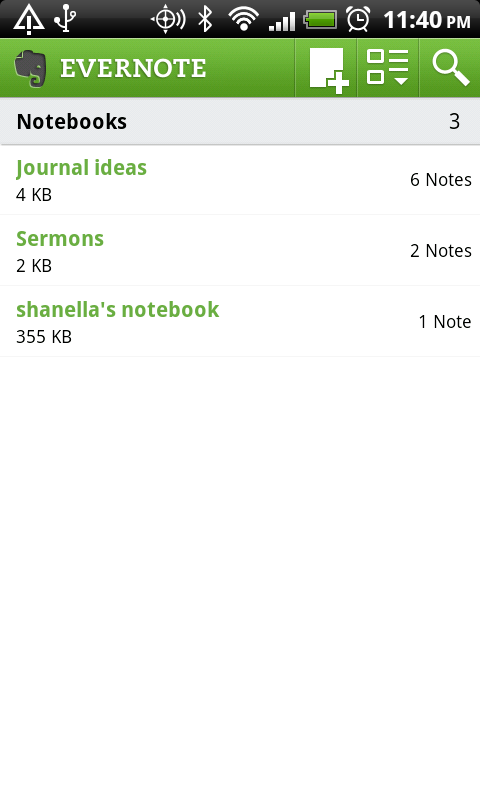 Or you can just view your notes that you’ve already started – regardless of where you started the note. Have you figured it out yet? I blog a lot. I’m not a fan of blogging on the go, but I do like to check in on my blogs from time to time. 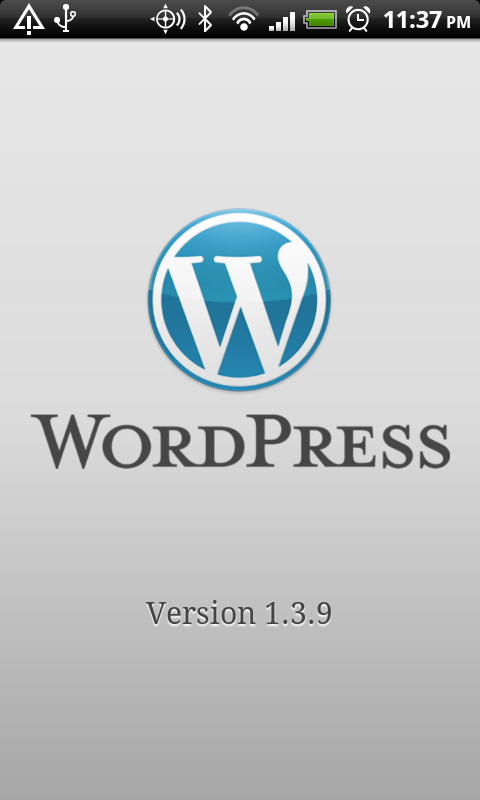 So when I saw some apps for WordPress and Tumblr I jumped at the chance to download it! Check your posts, or write them if you so desire (I prefer online). 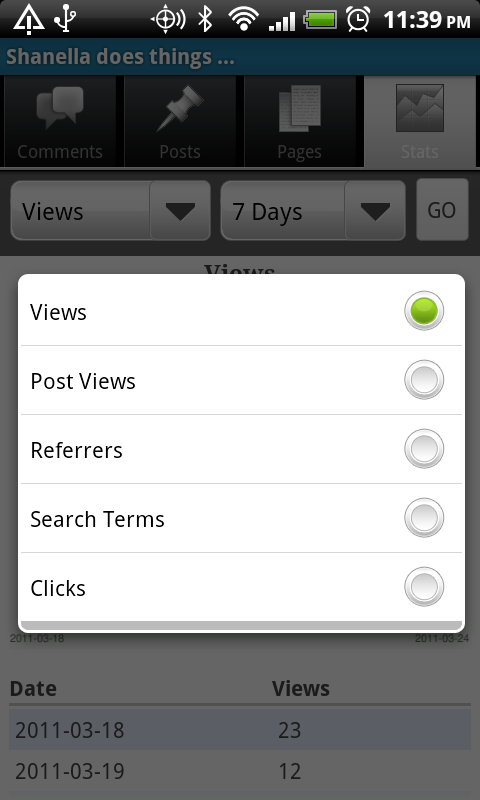 You can also view stats from your blog, which is great! The stats always interest me. With Tumblr you can see your dashboard and do simple things like reblogging and liking (to any of your Tumblr Blogs – I have two). You can also post just about anything to the blog that you could post on a computer. It’s very barebones, very simple, but since it’s Tumblr and it’s very easy to do things to begin with, I can see a lot of liking and reblogging happening on the go – and on 4G. 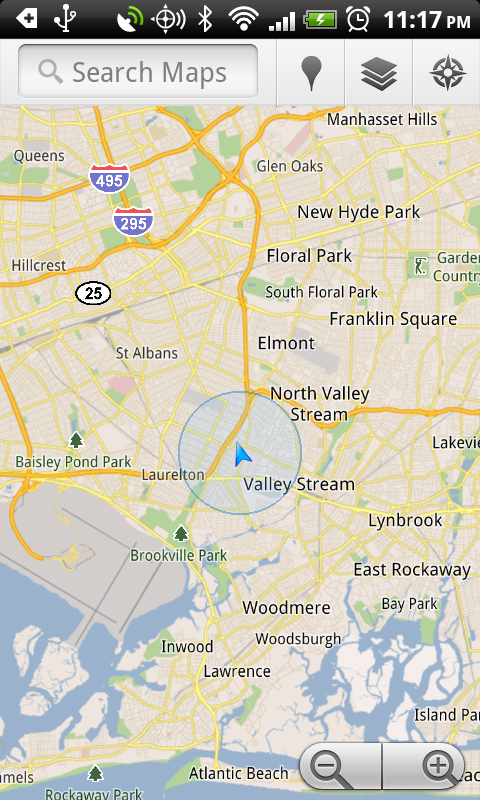 I’m a huge fan of Google — if you couldn’t already tell — and Google Maps is probably the only map I use. Even more so now that my GPS is in need of a car charger. 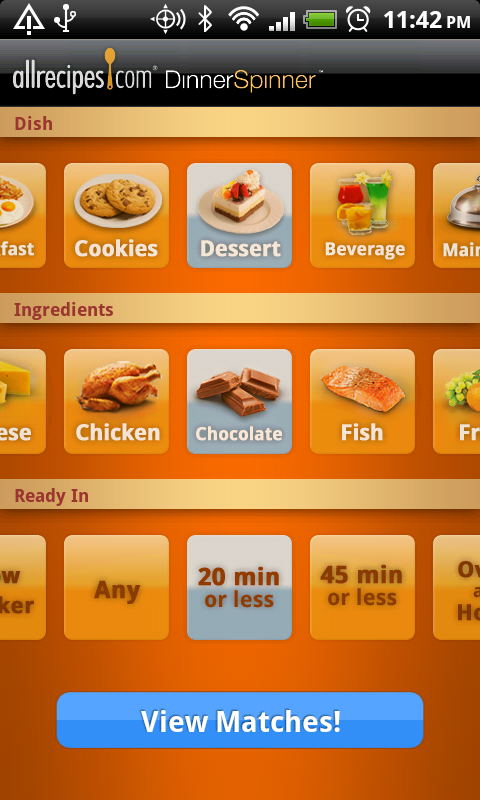 So having it integrated in my phone is wonderful. It has all the different layers that you would usually see online. My favourite layer (yes, I have one of those) is the Traffic layer. This is especially good for the days you want to avoid rush hour, or you are stuck in a crazy traffic jam in the middle of the day and want to figure out why. 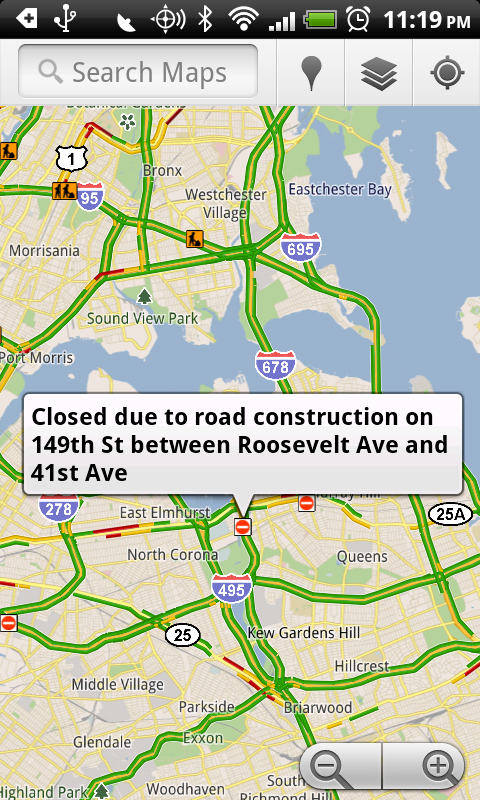 The map usually updates with accidents and road work, and I’ve found that it’s close enough to real time to be helpful. Once I was stuck in a traffic jam and we weren’t moving, when I pulled up the map to see how much longer I’d be in traffic, it showed me an accident ahead so I knew how many lanes were blocked and could then decide whether I should try to leave the highway or not. Since it was just an exit away I waited it out. 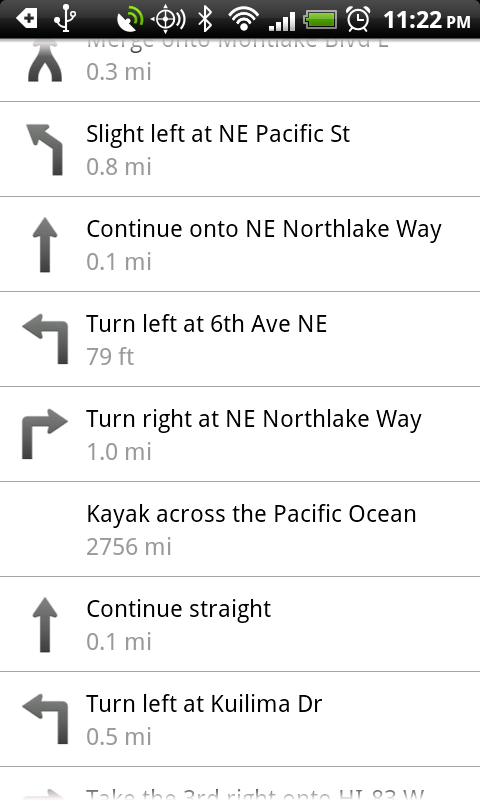 Of course you can use the map for directions. 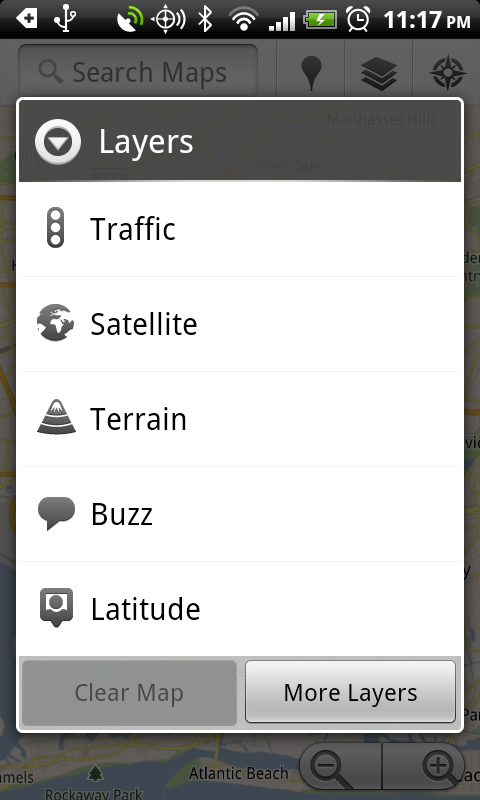 You can go from your location — based off of the GPS — or you can go from an address. I’ve always wondered, why a kayak to cross the ocean? Why not a sailboat, or even a canoe? 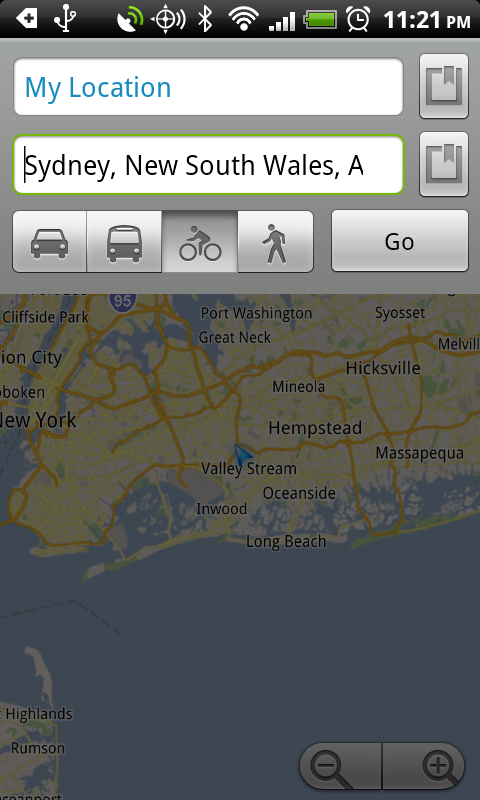 It doesn’t matter, I wouldn’t be going to Australia by car anytime soon. However, I will be going other places by car, so I’m happy to report that I will not be upgrading my GPS nor will I be buying a car charger for it, as long as I have my phone I should be fine.